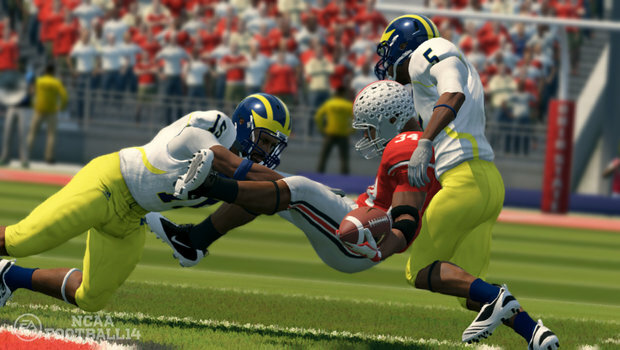 Earlier this year EA released NCAA 14, the latest in their popular college football franchise. Shortly after that, they had a bit of a scuffle with the NCAA. Disagreements over player rights and usage swelled up and the NCAA officially broke their long-standing partnership with EA. It was then assumed that EA would release another college football game next year, sans the NCAA title. It turns out that won’t be the case. EA has officially announced via their website that as of now they have no plans to release a college football game of any kind in 2014. The whole issue with college sports teams and video games surrounding them is an honestly confusing one. Technically the NCAA is just a name for the overall league, EA still goes out and negotiates with each team for the rights to use them in each NCAA game. So while EA could still have made a game without the NCAA, others seemed to have followed suit. Meanwhile, the NCAA and a number of conferences have withdrawn their support of our game. The ongoing legal issues combined with increased questions surrounding schools and conferences have left us in a difficult position – one that challenges our ability to deliver an authentic sports experience, which is the very foundation of EA SPORTS games. All in all this makes it tough for EA to get everything together into a working game. The team behind the NCAA series is being reshuffled to different parts of EA Sports, and the company is still planning to support this years game, though in what capacity, is unknown. This will be the first year since 1993 that EA won’t have a college football game to deliver to the masses.